Moist and flavorful banana muffins topped with a brown sugar crumb topping that will melt in your mouth. This is one of those old family recipes that is just plain good! It’s so simple and purely delicious. Everyone in the family is in love with this recipe and these banana crumb muffins sure don’t last long in our house! 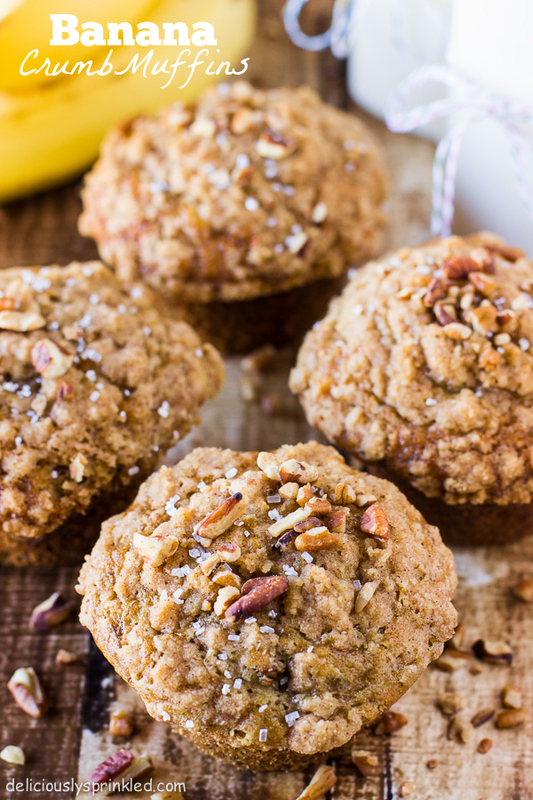 This is the perfect muffin for any banana lover and the brown sugar crumb topping is perfect! This is one of my all time favorite muffins and with bananas getting ripe in the house, I had to make these. The aroma that filled the house was AMAZING and it was so tempting to pop one in my mouth while I was taking pictures. Ahh they are so good! Pecans, chocolate chips, or walnuts would make a great addition to theses banana muffins, I added 1/2 cup of pecans to the batter and sprinkled a handful of pecans and sugar crystals on top for an added crunch! Preheat oven to 375F degrees. Lightly grease 10 muffin cups, or line with muffin liners. In a large bowl, mix together 1 1/2 cups flour, baking soda, baking powder, cinnamon, nutmeg and salt. In another bowl, beat together bananas, sugars,vanilla, egg and canola oil. Stir the banana mixture into the flour mixture just until moistened. Fold in pecans. Spoon batter into prepared muffin cups. In a small bowl, mix together brown sugar, 2 tablespoons flour and cinnamon. Cut in 1 tablespoon butter until mixture resembles coarse crumble. Sprinkle topping over muffins. Bake for 18 to 20 minutes, until a toothpick inserted into center of a muffin comes out clean. Sprinkle remaining pecans on the top of each muffin, optional. *Store muffins at room temperature in an airtight container for up to 5 days. 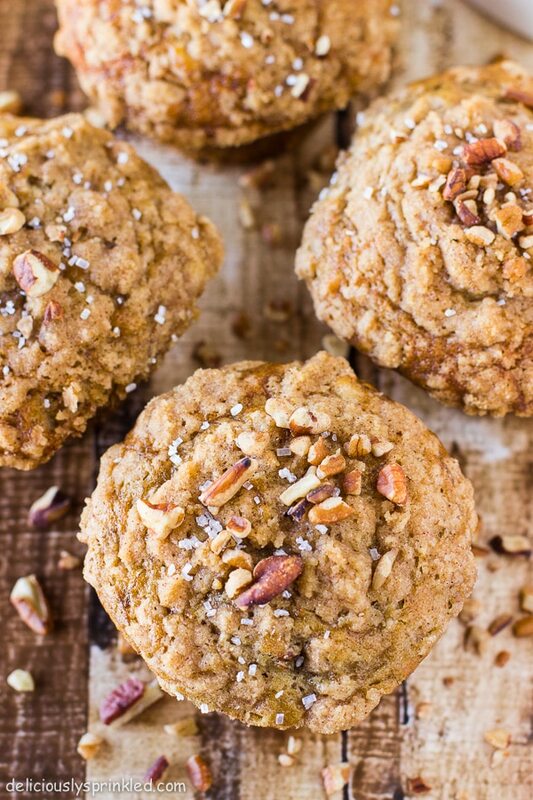 Hi Jenn ,Wow !These are the best banana muffins I have ever tasted. Love the crumb topping.Thankyou for sharing. IN THE RECIPE IT DOESNT SAY WHEN TO PUT THE VANILLA OR THE PECANS????? They were excellent anyway!! Thanks for replying! These muffins look amazing Jenn! 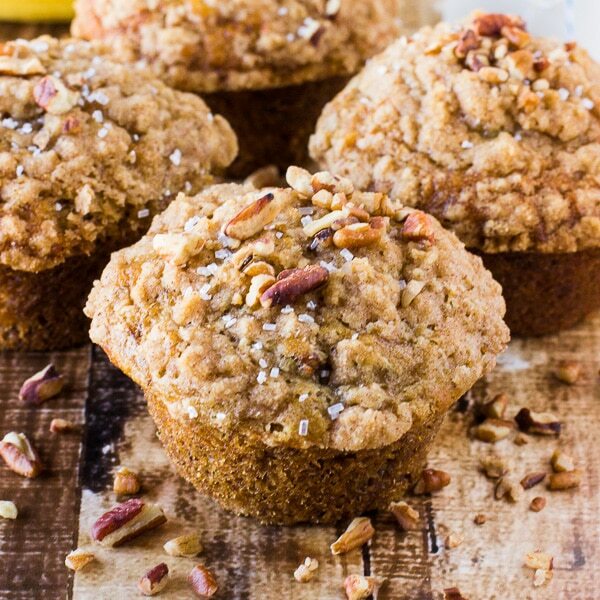 It is so hard for me to resist a muffin with a crumb topping – add pecans and bananas to that and these are just perfect! Pinning! Ohhhhh, I love all of the “crumb” going on in these muffins! Pinned! Oh, yum! Too bad I don’t have any ripe bananas right now, or I might just be heading into the kitchen to make these. Love the brown sugar topping. I think I would add a few finely chopped pecans to the topping, too. The streusel topping is just irresistible! These muffins are so pretty! I love crumb topping on my banana bread so I’ll bet it’s even more amazing on muffins! Can’t wait to try these. pinned! There is just something about a crumb topping that makes it impossible for me to resist a muffin! These look awesome! Have a great weekend!! You know what draws me to these muffins, Jenn?! The top!! It’s always the best part! This recipe seems to be wonderful. I always trust an old family recipe too 😉 Totally pinning for later. Thank you!! I LOVE crumb topping on muffins! These look amazing! The muffins look absolutely divine!